The little guy just wanted to wear the thong to show of his backside. That's one soon to be broken pencil. Konishiki is one of my all-time favorite rikishi, not just because he attained the rank of ozeki (and arguably should have been promoted to yokozuna) and not just because he was part of the great Hawaiian invasion of sumo; he is also one of my all-time favorites because each year he takes underprivileged children from Hawaii to Japan, but only after requiring them to spend months studying Japanese culture and Japanese etiquette. Plus he was very gracious to my aunt and uncle several years ago when they had dinner with him. A rather significant event happened in sumo this past weekend: Kotooshu won the Natsu Basho (May tournament) making him the first European (he's from Bulgaria) to hoist the Emperor's Cup. I think a lot of Japanese fans are at least thankful that someone other than a Mongolian finally won a tournament. In recent years Mongolian dominance in sumo has been par for the course. I think you have to go back some 15 basho (covering a period of two and a half years) to find the last time a Japanese rikishi has won a tournament. He rose quickly in the ranks, in a manner reminiscent to some sumo veterans of legendary sumotori from the 20th century. 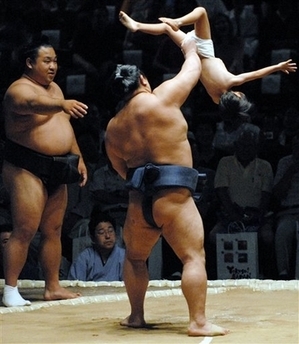 Kotooshu's ascent in sumo was very fast. One questions however, how much that had to do with the lack of quality depth in the juryo and makuuchi divisions. It is very obvious that he is just so much more athletic than his many of competitors. That said, once he was promoted to ozeki, he struggled mightily to maintain his ranking. A lot of that was due to nagging injuries, but another big factor was his lack of experience. Because he rose so quickly in the ranks, he didn't have near the tournament experience as others in the upper ranks of makuuchi, whom he now had to fight on a regular basis. It will be interesting to see whether he can continue to be a threat to win a tournament. His May victory did cast the spotlight on a sport which is unfortunately dying in Japan. Hopefully his success will renew some interest. However, for sumo to even come within sniffing distance of its past popularity, it will need to produce a Japanese yokozuna, and I don't see that happening any time soon. I believe many Japanese were happy with Kotooshu's success because that means there is another quality rikishi to stand in the way of Asashoryu's overtaking the records of Taiho and Chiyonufuji. I had the privilege of attending the first day of the LA Sumo tournament. The arena wasn't packed, but the folks that were there were totally into the matches. I sat further up in the arena, but I could still hear the collisions of the wrestlers. It was cool to see their pre-match warmup/preparations, the occasional stare downs, and the cheers of the crowd when the wrestler would toss the salt high up in the air. In the end Asashoryu was victorious over his compatriot Asaserikyu to become the first day champion. He ultimately became the grand champion of the tournament. I'll post some pictures here once I get a chance to process them. So where did you go to eat afterwards? I ended up eating at Daikokuya in Little Tokyo. I ended up waiting for almost an hour (there were many people waiting outside). The arena wasn't packed, but the folks that were there were totally into the matches. The failure to draw big crowds for the recent exhibition tournaments overseas is another indication of sumo's flagging popularity. Several years ago for an exhibition tournament in Las Vegas the arena was perhaps two-thirds full on the two days which I attended. Last year the Sumo Association was publicly critical of the disappointing number of attendees at the Honolulu exhibition tournament. And apparently the Los Angeles exhibition tournament did not draw too well either. Contrast with the exhibitions in San Jose and Honolulu in the 90's which drew great crowds. It's kinda sad how sumo's popularity has declined precipitously both in Japan and in the States in the last decade. Heck, my interest in it has waned a lot. The traditions, rituals, and rich cultural character of sumo have not changed, but the quality and character of its competitors has, and that's why fans like me who have followed this great sport for decades are no longer ardent about it. One of 'em might've been Triky. I like tonkotsu ramen, so I asked for it kotteri-style (with the fat in the broth). It was tasty. There may be better ramen elsewhere, but it was the best ramen on a Saturday night for me. Oh, here are some pictures from the sumo tournament. Keep in mind that I was halfway up the arena and was in the "mukou" or reverse end of the ring so I saw lots of rear-ends. That's cool...when it's on, it's on....that is to say the taste at Daikokuya. For me in the last few months it's been hit or miss...I really think it depends on who's in charge in the kitchen that night. I'm glad you liked it though.